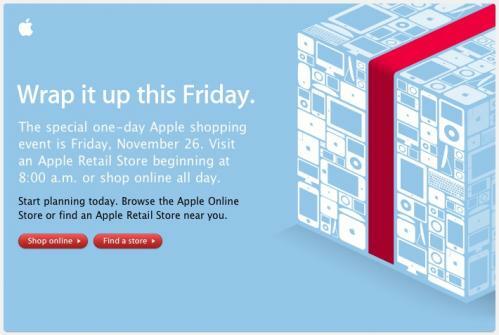 Apple today posted promotional images on its website and sent emails to existing customers teasing the company's one-day "Black Friday" shopping event set for this Friday in its online and retail stores. Black Friday is the day after Thanksgiving in the United States and marks the traditional start to the holiday shopping season. The day brings early store openings and deep discounts from many retailers, and ranks as one of the busiest shopping days of the year. Wrap it up this Friday. The special one-day Apple shopping event. November 26. Come back to the Apple Online Store the day after Thanksgiving for a special one-day-only holiday shopping event. You'll find dozens of great iPad, iPod, and Mac gifts for everyone on your list. Mark your calendars now. And until then, get started by browsing the Apple Online Store for great ideas. Emails sent to existing customers mention that Apple's retail stores will be opening at 8:00 AM on Friday. Apple typically offers modest discounts compared to other retailers, although many readers still like to take advantage of Apple's one-day-only prices. We've tracked Apple's annual Black Friday discounts for a number of years now, with last year seeing $101 discounts on iMacs and MacBook Pros, discounted iPod touches and nanos, $30 off of iWork, and deals on a number of accessories from Apple and third parties.